In late March 2012, I decided to change my life. No, that’s not when I was gluten-free, it’s when I launched my blog – Celiac and the Beast. This is back when restaurants were just starting to understand the phrase “gluten free” and when I was still calling celiac – Celiac disease (it’s lowercase – it’s not named for anyone). I just started to understand the intricacies of dining out – like no shared fryers, no use of regular oats, and other tips that sometimes takes learning directly from experience. Boy, did I have a lot to learn about the gluten-free world then, and I’m happy that you’ve come along with me for the journey! What a Huge 7 Years! Since 2012, I’ve travelled across this country visiting small and large cities talking about living gluten-free. I even wrote a book about celiac disease called Celiac and the Beast and you can buy it on Kindle or Paperback on Amazon right now! 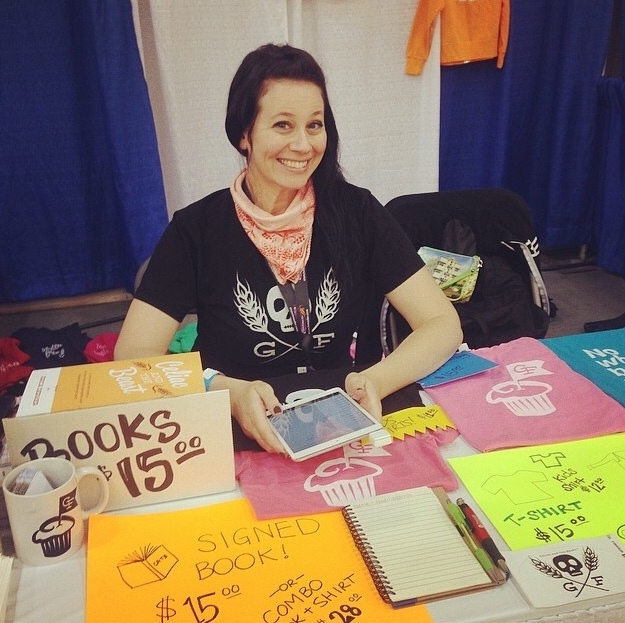 Had a successful line of gluten-free apparel – one of the first in the GF apparel game! Visited Disneyland one billions times including Disney’s 90’s Night! I was sent to Hawaii to report on Disney’s Aulani Resort. Told the world about my eating disorder story. I took over 500 classes at Pure Barre and survived to tell about it. Became an official cat blogger and I lost a best friend. I dressed up like a construction worker to promote Canyon Bakehouse’s new Heritage Loaf. I yelled at Party City for calling us gross and then yelled at gluten-reduced beer – a lot. Helped promote the launch of numerous celiac health products including Nima Sensor, Gluten Detective and imaware, community platforms like the Go Beyond Celiac community, and helped explain the launch of 23andMe’s celiac gene test to non-health literate. So happy blogging anniversary to me!And for those of you that have been around since the first post – THANK YOU! Let’s celebrate together! 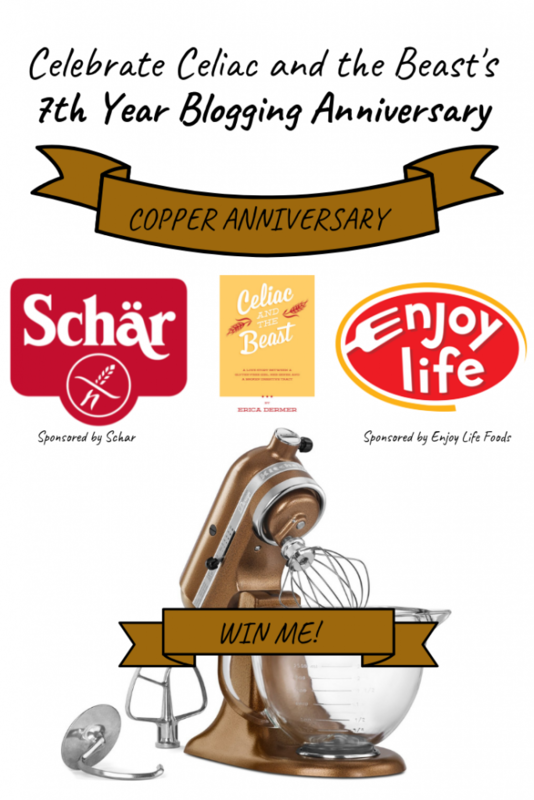 I’m giving away a copper KitchenAid stand mixer so say thanks! I’ll also be giving away lots of amazing yummies from sponsors Enjoy Life Foods and Schar! They’ve been such big supporters over the past years and I’m happy to be celebrating with them! 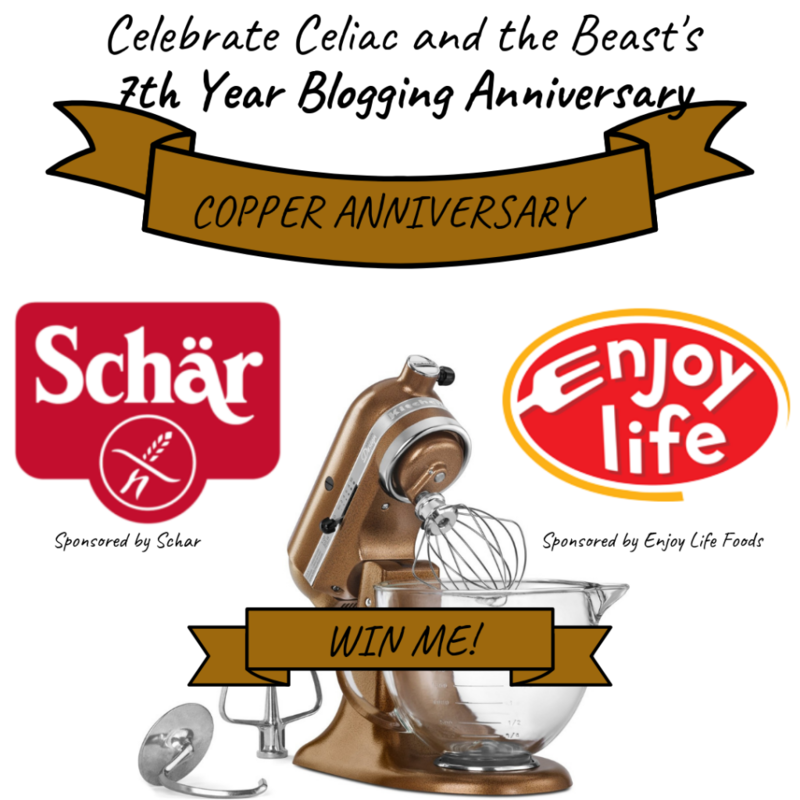 Stay tuned to more blog posts featuring Enjoy Life Foods and Schar and each one will have a SWEET giveaway! And stay tuned to my Instagram, that will also feature tasty gluten-free giveaways! Use the Rafflecopter widget below to enter yourself into the big giveaway! Awesome congrats on the 7th year!!!! 7 years is a long time— big congratulations! The celiac world has changed a lot— some for better, some for worse— but I’m happy we’ve all been holding onto the strong advocates like you. I found out I had celiacs disease 1.5 years ago and it has been very difficult to explain to restaurants and friends/family, and I live in Los Angeles! I can’t imagine people who live outside of big cities where there are more options. THANK YOU for your blog and creating resources to us celiacs and spreading awareness to those who work in the food industry yet don’t know what gluten is!! Congrats on your anniversary!! My journey has been interesting. In 2001 I could only find mixes and other things online. The food has really changed in the last 18 years!! It’s so much easier now. My life has changed for the better. I’ve gotten more food intolerances in 7 years but the availability is getting better. Congratulations on your 7 year anniversary! I’ve been following you for about 10 months now, ever since I was diagnosed with celiac. Thanks for all that you do!! So much in 7 years, and so much more to come! Looking forward to following your journey and hopefully seeing you again sometime soon! SEVEN YEARS. Holy cow. 7 years ago I had just started my GF lifestyle and was so naive about it all. I was eating the originals Udi’s bread that crumbled apart as soon as you looked at it because that’s all that was available. I was surviving off of meat because nothing else seemed safe. I was accidentally glutening myself because I didn’t understand cross contamination. So much can change in seven years! Congratulations on seven years! I’ve been gluten free for 10 years. I had to figure it out on my own because doctors never suggested it. Though they did test me for parasites! It’s been a big journey, but with people like you out there the journey is easier. Loved following along! Congrats on the milestone! Congrats on 7 years! That’s exactly how long I’ve been on my GF journey. I can’t believe I lived my life that miserable for so long. Thanks for all your wisdom. I LOVE LOVE LOVE YOUR BLOG! I’m not gluten free, but my friend is! She has felt so much better. Congrats on 7 years and going strong! I am doing fairly well with gluten free. 7 years? I did it for about 7 months and I couldn’t take it anymore! It’s difficult but worth it! I was diagnosed almost 7 years ago and there are so many more resources now. You helped me a lot at the beginning of my journey and I will always be grateful. Awesome! Congrats on 7 years. Congrats! I was diagnosed with Celiac disease 7 years ago. Been gluten free since then. It was very hard at first, but it’s getting a bit easier. Restraunts still have problems. Wish someone would start some strictly GF restaurant chains so we wouldn’t have to worry so much about being cross contaminated. i’m not gluten-free but my granddaughter is. She is dealing with it so much better since following your book and your blog. Bless you. I started eating GF about 5 years ago. I don’t have celiac, but am definitely gluten intolerant. The difference in how I feel from pre-GF days is remarkable. It’s exciting to see so many more GF and allergy-friendly products on the market. I would really love to win this ! Wow, congrats on 7 years!! I’m only a year in, but I’ve noticed how much healthier I’m becoming. Thank you for sharing all of your experiences, and advice. Congratulations! I am still learning. We are new to this It’s learning a new way of doing things after so long. I do have to say I am seeing and feeling improvement Misery is not an everyday constant in my life anymore. 7 years is a long time. I found out I had celiac when I was 15. Since then its been a struggle to get my family on board and understanding that i have had to make changes to what i eat, so family dinners like Thanksgiving get to be loads of fun. Congrats on making it 7 years as a blogger. Congrats on 7 years! I find that I feel more energetic. Congrats on 7 years! I have discovered better tasting gluten free recipes in the past few years. My life has changed for the better. Less stomach issues and just feel better. Seven years is a long time! Congrats on your 7 years! I watch what I eat and It is tricky! This is the beginng of my journey. I’m hoping for 7 years at least. There are so many delicious and accessible products now and more people understand about this problem. Congratulations on your 7 years and all your awesome achievements! You have done so much to further the awareness of Celiac disease. Didnt need to be, but congrats to others! 7 years ago I stepped down as the head of a local celiac support group. The person that took over is now ready to step down. Seven years is an amazing accomplishment! Keep up the great work! My gluten-free life is making me and my tummy feel better every day. Congrats on your huge accomplishment! My husband has celiac and we do good if we eat at home but going out to eat is really hard. The root problem may not actually be a gluten allergy problem. Instead, the glyphosate (Roundup) weed killer is also commonly used by farmers as a dessicant in order to harvest wheat with a low moisture content. Thus the glyphosate is being consumed along with whatever wheat product. Or not. Not at all. Celiac disease is a genetic disease and has appeared in medical history far before glyphosate. Also, gluten allergy isn’t a thing. Congratulations on your 7th year! What a way to celebrate! Celiac’s disease is so important. I honestly didn’t realize the importance until one of my best friends realized she had it. She was in such bad health, lost so much weight, and was very very depressed. It all came down to Celiacs!Thank you for your awareness and sharing with others! Congrats on seven years! I’m new to being gluten-free, but I have noticed a difference in how I feel so that’s good! Happy blogging anniversary!! So exciting 🙂 I love that you kept track of all your accomplishments. I should start doing that! Congratulations!!! I can’t believe it has been that long. I remembered following you in September 2012. Cheers to many more years. Congratulations on your blogging anniversary! Seven years is a long time, indeed. By eating a gluten free diet, I have found my joint inflammation has been greatly reduced. Also, it is a great way to eat fewer carbs and manage weight. Congratulations!! I have been gluten free for almost 3 years now since diagnosed Celiac. I have been following you ever since! Thank you for all you do!! I’ve been gluten-free about 7 years when I found out about me having Celiac. Both my sisters have Celiac as well. One of my kids has been tested, but no Celiac, but she may have something going on with Rheumatology. Auto-immune runs in the family. Your site has been helpful in the past 7 years as I navigate this journey. I’ve been gluten free for over 8 years and I’ve seen the variety of packaged foods expand and also seen the taste/quality improve. Congrats that is wonderful and Thank you for this awesome giveaway. And Thank you for doing this Blog and letting us know what is Good Gluten free and what is not it sure makes my life easier. Congratulations on 7 years! !I know I feel better! Congratulations on 7 years! I’ve found living a gluten free life has become easier the longer I live the life. There is much more information on living gluten free now compared to when I started 6 years ago. Who knows in 7 more years it may be much more mainstream to live a gluten free lifestyle and that would be great for all of us! Congratulations on your 7 years. Doing really well health wise since on the GF diet. Congrats on 7 years! And thank you for helping me feed my husband. He’s been gluten free for 2 years now and feels much better. I get a lot of tips and info from your site. Thank you for blogging about celiac! I have followed you for 5 years and counting. So many family members and friends have found out they are celiac or sensitive and I send them to your site first. Keep up the good works! Love your blog❤️ Congrats on seven years of helping others with gluten issues! Wow 7 years! I been dealing with mine for about 8-9 years, so glad they are coming out with my options today then there was back then! I have changed up my diet a lot in the last few years more and more gluten free foods. Congratulations! I just found your blog – it’s super helpful, thank you! WOW! That’s a long run! Congratulations. I am adding more and more gluten free products in my daily diet. Congratulations on your 7 years. I find so many tips from your blog posts. Thanks for being so inspirational. Seven years IS a long time…one BIG thing is there are so many more options and recipes! This is just the first 7 years – so many more to come, and so full of helpful suggestions! Wow you are my Shero! Congratulations on 7 years and all of your accomplishments. What has changed in my life is cooking and eating at home a whole lot more instead of dining out. I have just become more aware of being aware of what particular foods or ingredients have on me and thus what to avoid when possible. Happy 7! Much easier now to find GF, dairy free, etc. foods BUT it upsets me that I have to pay SO much more for food due to my dietary needs. Congrats on your 7th Anniversary ! That is quite the milestone! I feel so much better now that we eat at home and my energy level has improved. Congrats! I make a lot more at home than buy at the store. I have an almost 7 year old, that’s what’s changed here. Congrats on 7 years!! I have learned a lot from you ! Thanks ! A huge happy blogiversary to you, friend! What an amazing milestone! I would say, it has been a tough journey as well, but my body is finally happy.. and I feel happy! I haven’t made it that far yet but you are a huge inspiration.